1. An individual thing or element of a class; a particular object or item: An article of clothing or articles of food. 2. Particular sections or items of a series in a written document: Contracts, constitutions, or treaties are examples of articles. 3. A nonfictional literary composition that forms an independent part of a publication: For example, articles are printed in newspapers and magazines. 4. In grammar, the part of speech used to indicate nouns and to specify their applications or any of the words belonging to this part of speech. In English, the indefinite articles are "a" and "an"; and the definite article is "the". 5. Etymology: from about 1230, "separate parts of anything written", from Old French article, from Latin articulus, diminutive of artus "a joint". The meaning was extended to "a small division", then generalized to "an item, a thing". Older senses were preserved in Articles of War or "military regulations" (1716) and Articles of Confederation (U.S. history). The meaning of "literary composition in a journal, etc." (independent, but part of a larger work) was first recorded in 1712. The meaning of "pieces of property" (clothing, etc.) was first recorded in 1796. Relating to a joint or joints in a body: The articular surfaces of bones can be affected by diseases, strains, or damages that result from falling down. Relating to the joints of the body that have been affected with injury: Mary went outside where she slipped and had an articulary damage to her left hip. A reference to speaking clearly, both in pronunciation and how a person presents his or her ideas: The senator had definite opinions, but sometimes he was unable to express them in an articulate manner. The lawyer's articulate defense of his client was an essential element in securing her release from prison. 1. To express thoughts, ideas, or feelings coherently: "He was unable to articulate his grief regarding his wife's death." 2. To pronounce something or to speak, or to utter, intelligible speech clearly. 3. Able to express thoughts, ideas, or feelings coherently. 4. To form the kind of joint or connection that allows movement. 5. With joints or jointed segments that allow for motion, as in the bodies of higher vertebrates and arthropods: "The joints articulate, by uniting or connecting in order to allow movements of the hands, fingers, arms, toes, legs, etc." 1. The act of vocal expressions, utterances or enunciations: Sharon expressed an articulation of her classes sentiments to the English teacher. 2. The act or manner of producing a speech sound; especially, a consonant. 3. In anatomy, a fixed or movable joint between bones, or a movable joint between inflexible parts of the body of an animal. 4. In botany, a joint between two separable parts: There are articulations of leaves and a stem or a node or a space on a stem. 5. Etymology: from about 1541, "the action of bending the joints", from Old French articulation, from Middle Latin articulationem, articulatio, from articulatus, the past particple of articulare, "to separate (meat) into joints"; also "to utter distinctly", from articulus, diminutive of artus, "joint". Articulate, as a verb, in the sense of "divide (vocal sounds) into distinct and significant parts" is first recorded in 1594; then it was generalized into the sense of "express in words" from about 1691. 1. In anatomy, a device for effecting a joint-like union. 2. A part of the vocal organs that helps to form speech sounds. Active articulators include the pharynx, soft palate, lips, and tongue, while the passive articulators include the upper teeth, the alveolar ridge, and the hard palate. 3. In dentistry, a mechanical device, representing the jaws, to which casts may be attached: The dentist uses one or more articulators which can be used in the making of dentures. Pertaining, or relating, to an utterance or an expression of speech or communication: Obviously porpoises are articulatory creatures; however, they are not capable of speech as we know it. 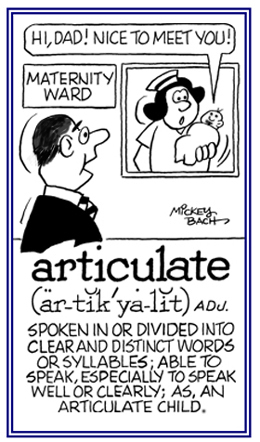 Politicians are more articulatory people than most of the other citizens of a country or nation. Pertaining to having, or consisting of, two joints: The antennae of certain insects is one example of biarticulate creatures. 1. The union or articulation of two or more speech sounds together, so that one influences the others. 2. The connection of bones to form joints. To disjoint or to separate joints. 1. To separate at the joints; to disjoint. 2. To make or to become disjointed, as the bones in a body or the stems of plants. The amputation of a limb of the body through a joint, without cutting the bone.